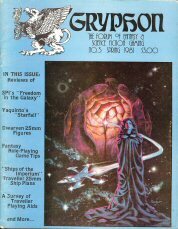 ARTICLES: Empires in Conflict: Worlds in the Balance - A review of GDW's Imperium; Interview with Gary Gygax by Rudy Kraft; Galactic Companion, part 1 - Expanding Ship Plans; Interplanetary War as Worlds Collide - a review of GDW's Double Star; Providing Background Information on the Religions in Runequest - a review of Cults of Prax by M.A.R. Barker; Cults of Prax Designer's Notes by Greg Stafford; more. 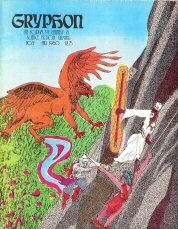 ARTICLES: Create a Religion in Your Spare Time for Fun and Profit by M.A.R. Barker; Task Force Four - A detailed review of four different science fiction boardgames from Task Force Games; Task Force Four Designer's Notes by Steve Cole; The Beastlord - a review of Yaquinto's new fantasy boardgame; Beastlord Designer's Notes by Michael S. Matheny; The Galactic Companion, part 2 - Character Record Forms; Creative and Realistic Maps for FRP Gaming, part 2 - Mountains; more. 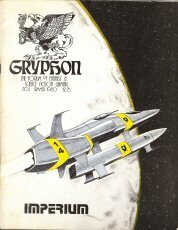 ARTICLES: Freedom in the Galaxy - A review of SPI's game of galactic rebellion; Freedom in the Galaxy Designer's Notes by John Butterfield; Starfall - A review of Yaquinto's science fiction boardgame of exploration and colonization; Marine 2002 - The First Lunar War - review; Fantasy Role Playing Games Tips by William R. Keyes; Ships of the Imperium - Ship Plans for Traveller part 1 - SSLG; Galactic Companion part 3 - Playing Aids; Creative and Realistic Maps for FRP Gaming, part 3 - Water Features; more. 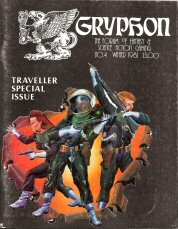 ARTICLES: Phildor - A world profile for Traveller; Foundations for a Fantasy Role Playing Campaign by Marc Miller; Crash on Cunnoic - A scout adventure for Traveller; Ships of the Imperium part 2 - 400-ton merchant vessel; Four Mercenary Tickets - Scenarios for Traveller mercenary teams; Galactic Companion part 4 - Playing Aids for Traveller; Academy of the Black Arts - Spells used by FRP gamers; Creative and Realistic Maps for FRP Gaming, part 4 - Towns and Villages; more.